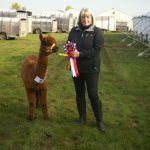 Many of you will know of Ep Cambridge Lady Gaga, our beautiful light fawn female, purchased at the elite British Alpaca Futurity Auction in 2010. I still remember our precise bid of £13,600 placed in the final seconds, and winning the online auction. Not an inconsiderable amount, but she has been worth every penny and more. 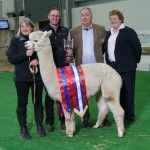 Not only is she a Supreme Champion, she has gone on to produce championship winning progeny, who have then gone on to produce champions themselves. Three generations of quality include: Beck Brow Cat’s Pyjamas (Supreme Champion winning female and dam of Bees Knees) and Beck Brow Jimmy Choos (Dam: Beck Brow Snooty Boots. 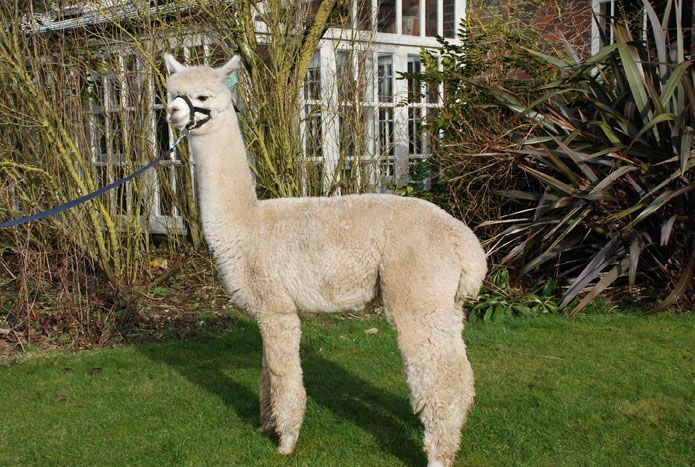 Grand-dam: Lady Gaga) a multi-championship winning male now standing at Inca Alpaca. Why am I reminding you of all this you might ask? Well, I have decided it is time to share. 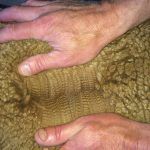 Gaga has three daughters, and Snooty Boots has produced one of our best coloured females this year (all the more reason to keep hold of this line you might think!). So it is that, we have released a daughter, Beck Brow Posh Pants (sire: Waradene St Patrick of EPC) who is a full sister to Cat’s Pyjamas and Snooty Boots. 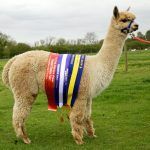 However, what makes this particularly exciting, is that Posh is pregnant to our in-house stud, Gilt Edge Samurai of Beck Brow (recent Supreme Champion at YAG Show). Beck Brow Posh Pants (Dam: Ep Cambridge Lady Gaga. Sire: Waradene St Patrick. Bozedown Magic Charm. Dam of Just Like That. Beck Brow Just Like That in second position – photo July 2016. It hasn’t been all happy news unfortunately. After coming through her acute illness, Indie Pop took a turn for the worse, after improving for 11 days. This coincided with stopping the ranitadine, and we initially put the symptoms down to pain. She was given Buscopan, restarted on the ranitadine and we managed to get hold of some injectable Pantoprazole (thanks to Claire Whitehead). The signs were saying abdominal pain (hunched and off her food), but she was also showing increasing neurological symptoms. Believing that the stress of the illness may have depleted her thiamine levels, vitamin B1 was commenced at 5mgs/kg every 6 hours. The following day the neurological impairment was worse. She had obviously lost all of her sight, bar some peripheral vision, and she was high stepping and circling. The vitamin B1 was increased to 15mgs/kg every four hours and she stabilized but did not regain her vision. We carried on for a full course of vitamin B1 but she had no significant improvement. When we eventually stopped (as we really felt she had endured weeks of treatment) she deteriorated rapidly and we called the vet to do what we felt was only kind thing by this stage. So sad after she battled so long. Her dam never stopped looking after her, even when the rest of the herd had started to reject her (her lack of vision scared them I believe). 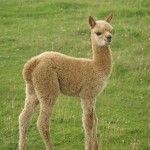 Such a beautiful alpaca ( both in nature and quality) to lose at 6 months of age. The initial results of the PM show a large cerebral abscess so we made the right decision. We hope we will learn more as it was a very confusing presentation. She showed no real signs of sepsis, other than red eyes at the initial point of illness. No abnormal temperature, no increased respiratory rate or heart rate (although she did have the episode of dehydration). She had had a course of Marbocyl, an antibiotic which does cross the blood brain barrier. I am realising that it is difficult to get young stock through an infective illness (no different to lambs and calves) but I only hope we learn more for future care. The rest of the youngsters are doing well. 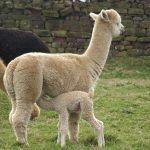 Our dams with cria have been in at night for three weeks (So Indie was safe at night – she was out during the day). 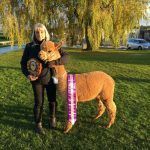 With the lights left on in the barn until 10pm, the mums and cria have been enjoying the hay and the weight gains have been good. 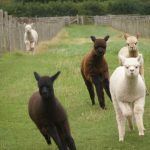 Three of our cria have been in the fine dining club for a few weeks. 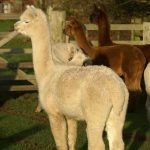 This is an invitation only event, which allows members to eat their Hembra and Cria plus sugar beet without any chance of being mobbed by passing ruffians. Angie’s Tribute (orphaned) and Memphis and Lulu (dam’s reduced milk supply) have been enjoying this experience, and learned quickly to come to the pen door at feed time. However, I feel my front of house standards have slipped of late. First it was Hip Hop who requested to join (well she is a bottle fed), then it was Rubic (well is very cute), then it was Just Like That (she is very sweet and polite)…then it was Bees Knees (what can I say he has no manners – none what so ever)…it has turned into a rave…I have lost control…next thing it will be on Facebook!